The Tso Jey clinic is located in Rumtek, Sikkim, India, on the grounds of the Rumtek Monastery, seat of His Holiness the 17th Gyalwa Karmapa. In 2010, Bodhi Seeds funded the construction of Tso Jey and since then, Tso Jey has provided primary health care for the lay and monastic communities. A western doctor visits once per week, a Tibetan doctor every two weeks, and an onsite nurse provides daily care. Tso Jey is also the principle site for directly observed treatments of tuberculosis. This fund helps sponsor a child's school fees. This gives a valuable foothold for children's advancement. Specifically, this fund helps children attend local schools when they would ordinarily not be able to do so. The school fees range from $400 – $800 per year. Some schools are subsidized and have lower fees, others are private schools with higher tuition. You may sponsor a child’s education through this fund. If you can only afford to sponsor a portion of the fee, we will find other donors to complete the full amount. 100% of your donation goes to the school fees. We will give you the name and photo of the child you are sponsoring. Legon, Tibet, is the site of our latest health project. 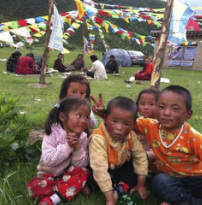 These Tibetans live out their semi-nomadic lives at 13,000 feet, making logistics quite difficult. After consultation with experienced global health veterans and the Legon community, we’ve agreed to begin Legon Health in 2014 with an “on-the-ground” feasibility study, and with teaching birth attendants skills to reduce maternal and newborn illness and death. This fund provides personal spending money for things such as toothbrushes, clothing, books, and for some expenses to visit family during holiday. These funds are valuable in boosting the health and well being of monks in their daily lives. There are approximately 370 monks presently at the Monastery. 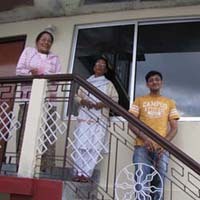 The stipend is 1,200 rupees (about US$30) per year, distributed bi-annually for the summer and winter holidays. You may sponsor a Monk’s Stipend with a gift of $30/year. We invite you to sponsor as many monks as you can! This fund is an unrestricted fund and is used for Bodhi Seeds projects where there is the greatest need. It enables the administrators to place money where it is needed most.